When I’m at an estate sale grubbing around with dozens of other people trying to find the “best stuff” in the house, I have no delusions that I am doing anything noble or helpful to humanity. And the things I sell, well, it’s just stuff. Unessential flotsam and jetsam. But for now it’s fun, I make a little money (my neighbor Annie quipped, “it’s your margarita money”) and every now and then I get to hear a great backstory about why somebody bought something. These stories are little treasures that make my day. Here’s one I received recently from a woman who bought this ring from me. It is just the best!!! “My aunt came too visit from Florida in 1951 and while she was here she took that same ring off her finger and gave it to me. Maybe I admired it so much she felt that she had to give it to me. I don’t remember that part. But I loved that ring!!!! Then, when I was in high school, someone shut my locker door on my hand. It wasn’t being mean or unkind, just kids fooling around. 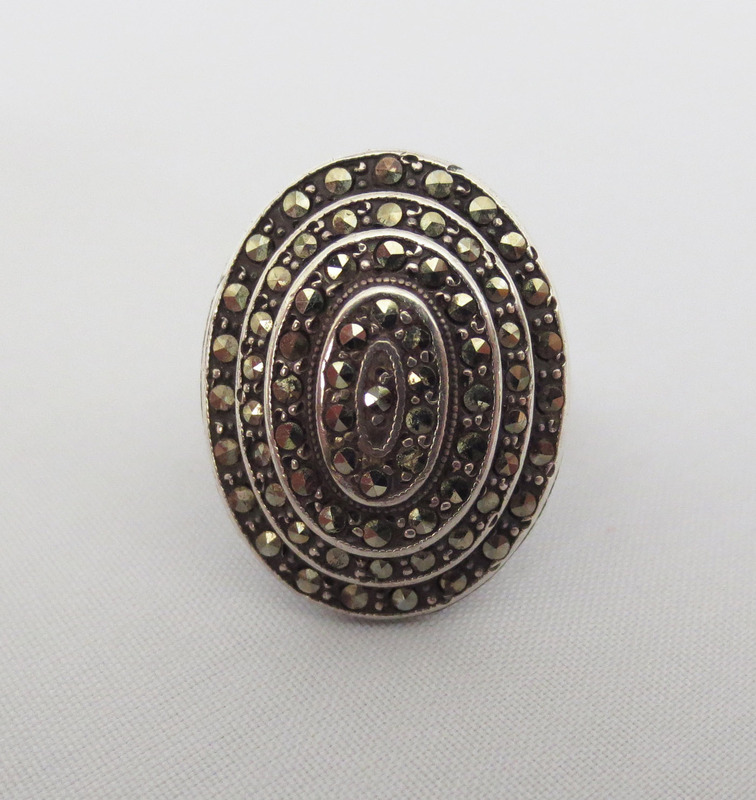 Anyway, the band was bent and the top of the ring was dented and some of the marcasite stones came out. The ring was ruined and I don’t know what I finally did with it. But I have wanted that same ring for over 57 years and now I have it!!!!! Thank you so very much.” – J. And thank you J. for taking the time to tell me your story. Do you have any great stories why you bought something?